Since around the late 1940’s there has been a geography presence at Texas A&M. The non-degree granting geography program offered classes for over 20 years before the Department of Geography was officially founded in 1969. Geography was one of the last departments at Texas A&M authorized by the Texas Coordinating Board for Higher Education for bachelor’s, master’s and doctoral. The creation of the department was part of a university wide change including the change in the school’s name from Texas Agricultural and Mechanical College to Texas A&M University, the admission of minority and female students, expansion of research programs, and a $100 million building program. For the next couple of decades, the goals of the department were to increase undergraduate enrollment and prove that the Geography was a necessity in the College of Geosciences and at Texas A&M University. A number of new courses were added to the curriculum and active recruitment began. Focus on teaching and growth in undergraduate services resulted in dozens of new geography majors. Geography courses became a part of the university’s core curriculum. Physical Geography gained a seat in the small group of core science courses at TAMU. Regional geography courses were accepted as humanities courses and human geography courses were accepted as social science courses leading to increased enrollment and an increasing interest in geography from many students. The graduate program grew slowly but steadily at the M.S. level. The addition of the non-thesis M.S. in Geography was approved in 1978 and sped up progress for many students. 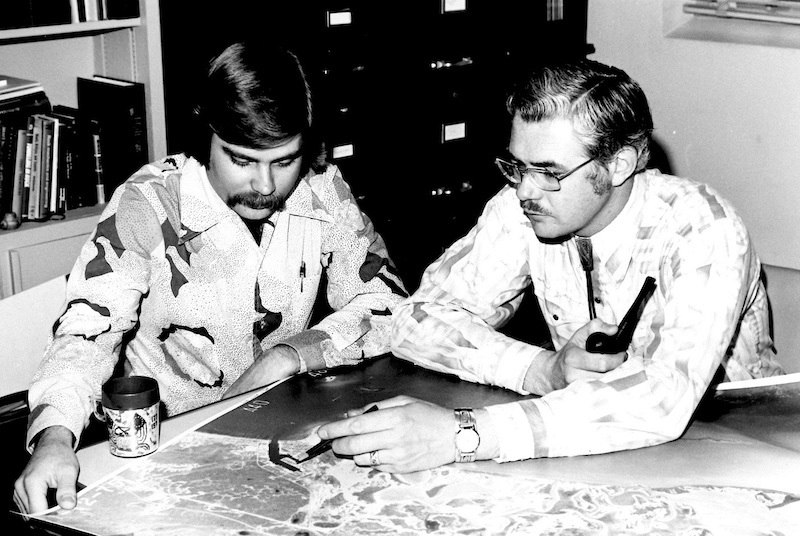 Introduction of the GIS program began in the late 1980’s and by this time, there was success in both undergraduate and graduate programs. The 90’s was a decade of growth for the department as it continued to increase production of graduate students. A number of faculty members were hired and by 2000, the department had 13 full-time faculty members. The new goal of the department was to increase graduate student enrollment without impacting undergraduate enrollment. The department collaborated with the Department of Forest Sciences (now Ecosystem Science and Management) at Texas A&M to create two graduate certificate programs; Remote Sensing and Geographic Information Science. In 2000, the department received its first endowed chair, given to the College by Bill Haynes, former CEO of Standard Oil. As a part of the college-wide environmental degrees, a B.S. in Environment Studies was added to the Department of Geography. By 2003, the number of full-time faculty members was up to 15. A number of new geography faculty members were added as a result of then-President Robert Gates’ Vision 2020 goal and faculty-reinvestment act. By 2010, there were 10 new geography faculty members. During this period, the department took the lead in establishing Texas A&M University’s Soltis Center for Research and Education in Costa Rica. Since 2009, geography summer lectures, field trips, and laboratory courses have been offered for Texas A&M Students as part of the study abroad program. Research in the department has been on the rise since the 1990’s. We have increased research capacity and productivity since 2005. The department currently supports a number of research facilities including Climate Science Laboratory, Plant Geography and Dendrochronology Laboratories, GISciences Laboratory and suite, Stable Isotope Geoscience Facility, Dendrochronology Workshop and Sediment, and Geomorphology Laboratories. Fall of 2014 was the introduction of the B.S. in Geographic Information System and Technology (GIST) which allows for students to focus on the growing field of GIST. Undergraduate students are able to experience high-impact learning activities such as outdoor laboratory activities, study abroad (Brazil, Dominica, Coast Rica), field trips (Galveston-Houston, Mexico Border, West Texas Wind Corridor, Gulf Coast, Mexico City, Brazos County), and first year seminars. The Graduate Program in Geography produced 35 doctoral students between 2002 and 2011, with several holding tenure-track positions in PhD granting institutions. Graduate students are increasingly winning national awards such as NSF Grants, publishing papers, and are winning awards at regional and national conferences. While there have been many changes over the last 50 years, one thing stays the same. The goal of the department is to provide the best possible teaching, research and services. We have experienced many periods of growth and plan to continue this positive trajectory by building on our foundation.